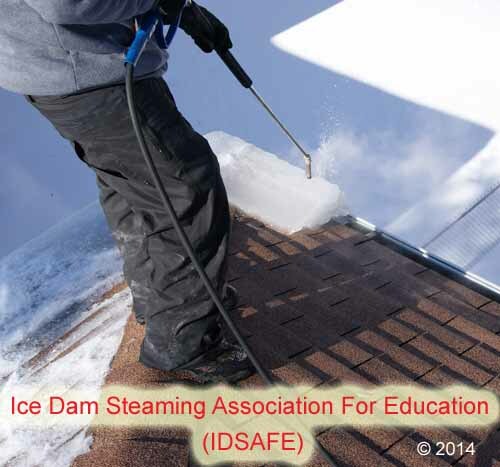 Experts Recommend Ice Dam Steaming - Why Steam? Experts recommend ice dam steaming because it has been proven to be the gentlest ice dam removal process on all roofing material. Such experts include roofing manufacturers, roofing companies, insurance companies and property management companies to name a few. Ice dam steaming has become a big thing in the snowy regions of the United States including Alaska and Canada. Now let’s clarify, what is ice dam steaming? If you haven’t read the previous page link, that’s okay, we’ll talk more about it here. This subject needs clarity because there are many companies who use the wrong equipment (hot pressure washers) and call them steamers when in fact they cannot even reach steam temperature. When we use the term ice dam steaming we are referring to LOW PRESSURE ice dam removal equipment designed for ice dam steaming. The correct pressure of low pressure equipment is between 150-300 PSI. The correct temperature of a steamer will be between 250-300 degrees F. Pressure washers reach about 150-200 degrees F using cold water and generally run between 1000-4000 PSI! Sound dangerous? It sure does! This high pressure water can destroy a roof quickly! Don’t let a smooth talker convince you that his pressure washer is safe for ice dam removal! Even a small amount of sand removed from asphalt shingles is a big deal and will lead to premature roof failure. A roof that should have lasted 30 years may now only last 15 or 10 years, or less! Education is the best way to avoid pressure washers on roofs. If you have any further questions or need sources to why experts recommend ice dam steaming please feel free to contact us with any questions you may have. We will try to help you in any way possible. If you need to hire one of our members in your area, let us know.